The grand opening of our Student Zone is slated for this coming June. Even though we've been assured that this date is fairly accurate, I've been hesitant to get my hopes up. But, seeing the building beginning to get wrapped in insulation brings a shot of optimism. I spent quite a bit of time yesterday brainstorming operating hours, ways the building will help us reach our community, etc. I'm beginning to get excited. But, it's also a really strong reminder that buildings and programs don't change lives. To suddenly rely on our student zone or hope that it is some sort of silver bullet for our ministry would be a huge mistake. Even when we move into this incredible facility, our ministry focus will be the same: Connecting students to caring adults who can help point them closer to Jesus. No building can do that! Right now I'm sitting in a room as people trickle in for our annual, mandatory, sexual harassment training day. A certain episode of The Office comes to mind. Speaking of the office....can't wait for tonight's season premiere. My family is taking my dad to the LA County fair so I'll watch it late tonight. Our small group season has officially opened. We start about a month into the school year to allow our kids to get back into the groove of homework, etc. Last night, we kicked off with the first of two small group leader training nights (we offer two for convenience...leaders pick one). About 1/3 of our leaders are brand new this year and a good chunk of those leaders have moved up from our children's ministry. Our children's ministry has an INCREDIBLE small group program and each year we get leaders who want to continue leading the same students they've had through out elementary school. Next Monday night we will have our annual 'Meet N Greet' which allows students and parents to meet their leaders, get maps to the host home etc. It's the only time all year that all the small groups and their parents get together at one time. It really is a major event for us. Finally, the following week we begin meeting as groups in homes. This year feels like it's shaping up to be a great one. This weekend, Allison and Bethany tagged-teamed the lesson. Next week, we kick off what I think will be an interesting, but challenging series: "Get Out Of My Face...how to handle conflict"
On a side note...we spent most of the weekend painting my daughter's room. When she was about 5, we painted it a sand color and decorated it in a Hawaii theme. It was more our idea than hers, and she never really loved it. 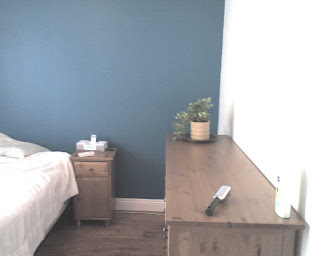 She's been asking for a room makeover for several years and we finally got around to phase one which was the paint. She wanted all white with one blue wall. I took the picture because I've never seen her room this clean and thought I'd enjoy the moment. I spent some time browsing through this booklet produced by the U.S. Department of Education for parents of young teens. There's actually a whole lot of good stuff. Unfortunately, there's also a whole lot of really goofy looking illustrations. So bad, in fact, that I had a hard time getting past it. It made me think about the 'look' of certain things in my ministry that I feel are really important. Are some things taken less seriously, or is my ministry deemed unprofessional, out of date, untrustworthy etc. simply by how aspects of it look? After being delayed in the twin cities for over an hour trying to catch my connecting flight to Grand Rapids, and driving about 2 hours to the camp, we arrived last night to catch the tail end of dinner. Kind of a bummer when the three hosts of an event show up 90 minutes late! The camp we are staying at is fantastic. Spring Hill feels massive (not sure what the actual acreage is) and has tons of cool features. Paintball, a really nice skate park, lake, pool, two sets of really long zip lines, rope courses, etc. They even have an old WWII Bomber that they've turned into guys dorms. I gotta think it would be a perfect place for a junior high camp. In fact, Marko came here to camp when he was in junior high. That was certainly before the paintball, and skate park. Come to think of it, the WWII Bomber was probably still dropping bombs somewhere! A great group of about 40 or so 'middle school only' youth workers are here. Last night, we spent 90 minutes simply going around the circle introducing ourselves and putting possible discussion subjects on the 'board'. I think we've got the potential for some really lively and insightful dialogue. We had a great weekend. Megan Hutchinson, who heads up our ministry to hurting kids, wrapped up our 'Old Timers' series with a great lesson from the life of Esther. Until now, I've never found youthministry.com to be a super helpful site. It launched yesterday with a brand new look and a whole bunch of new resources from a variety of folks as well as a ton of free articles and downloads. It must take an amazing amount of unconditional love to accept the fact that Chris Farley has been reincarnated as your three year old daughter. 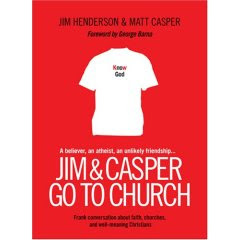 Last night I sat down to glance through Jim and Casper Go To Church, and didn't put it down until I was finished. It's an easy read with lots to say. However, I do have one critique that, in my opinion, makes this book much less valuable as a practical ministry resource: The fact that Casper is an atheist. True atheists make up such a small part of our population, that a book based on an atheists initial impressions seems to miss the mark. How many practicing atheists are visiting our churches? I think somebody who is open to the idea of church but hasn't attended in years for all the usual reasons, or has never been, may be a better candidate. It seems to me that many more people in the 'I'm kinda open' category visit our churches than do atheists. It's possible that some of the observations and reactions would have been the same, but I can't help but wonder how they'd differ. A little while back, Josh Griffin had a post listing 10 questions to ask before taking a youth ministry position. You can see his list for himself here. "Can you please share some of the unwritten expectations I would be expected to fulfill?" - The youth pastor always makes the hospital visits to students and would never ask a volunteer to do that in his place. - A good youth ministry is one that has something for students at least 3 times a week. - Pastors kids should be given special privileges. - If you don't teach verse by verse, the lessons aren't deep enough. - The youth pastor should be in the office as much as the executive pastor is. My hunch is that few, if any, of these would be discussed in a formal interview. However, these are classic examples of the type of unwritten expectations that every church has of it's youth pastor. We had a great weekend. Attendance was up (Summer is finally over) and excitement was high. We are in week #2 of our "Old Timers" series and this week our lesson was on Shadrach and his two friends. For the first time in a real long time, I ditched most of the message after the first service because I felt like I really missed the mark. I think it was the right move because the next two lessons seemed to be on target. This is the first Monday of the school year which means date day! To kick off our date day season, I'm going to surprise Rachel with brunch at a mystery location that Leigh Sarti recommended. Should be fun. Tonight also kicks off our Monday Night Football rotation. Tonight, dinner and the game at Ron and Katie Edward's house. Wow...I really love the Fall! The following story is 100% accurate. Today, I returned to the gym for the first time in about 3 years. While not grossly out of shape, I have put on a few pounds and developed some lazy habits that are bound to catch up to me as I head into mid-life. Having not lifted a weight in 3 years, I decided it would be a really good idea to 'ease back into it'. as my buddy (who is also 'easing back into it') and I were working on our triceps, a woman in her mid 60's looked at the amount of weight I had on the machine and said, "Wow, if you go any lighter you're going to have to trade beds with your wife." 1) I can't believe a 65 year old lady would actually drop a zinger like that....hilarious! 2) Apparently 65 year old married couples sleep in seperate beds and assume the rest of us do, too. Had a couple really busy days on Tuesday and Wednesday and just couldn't find time for a post. So, although this post is probably a couple days too late in coming, it's on my mind. The Church lost a good man in the passing of D. James Kennedy. About 20 years ago, I was a brand new youth pastor in a church that was implementing Evangelism Explosion, a door-to-door follow up program created by D. James Kennedy. The basic idea of the program was that church members would visit people who had visited their church and, by asking two very simple questions, determine the direction the conversation would go. The focus of 'E.E.' was to train lay people in how to share the gospel and lead somebody to relationship with Christ. As a staff member, I was required to go through the program. It was a canned, 20-minute presentation that covered 5 key areas: Grace, Man, God, Christ and Faith. I'll be the first to admit that the program had more than it's fair share of problems and the idea of sharing a canned presentation makes my skin crawl. However, to this day any time I share my faith or my journey with Christ I almost always use parts of the E.E. presentation. I'm not a fan of television church ministries, and I'm not a fan of canned evangelistic programs. D. James Kennedy was a master of both. But I was a fan of his and I'm sad we've lost him. As you can see...it was an above average weekend in just about every way. Every way, that is, except my lesson. To be fair, teaching on King Saul isn't super easy and I struggled a bit during our first service. I fine-tuned a few things in between services and feel like the rest of the weekend went pretty well. We did a great job building a theme throughout the program. We played a silly game called "The StacKING of the burgers" and the winner was king for the day and got to sit on a throne on stage with snacks etc. We played "King, Sword, Dragon" and gave away little Lego castles as a prize. We had a fun King Saul video to set up the lesson. All in all a pretty good kick0ff to the series.